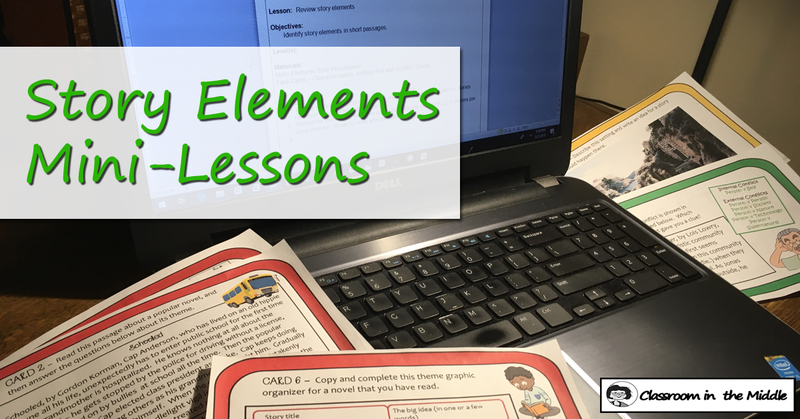 The fun part of reading class is reading the stories, not teaching lessons about stories, but sometimes a story will provide a great lead-in to a lesson on a particular story element, and of course, these lessons in context are often the most effective ones! For example, maybe a story that your class is reading together has a really interesting setting – a time and place that the class responds to. They are enthusiastic to know more about it. Or maybe kids reading responses to their individual books show you that they are missing some important elements of the writing that could make the story more meaningful to them. Do the character descriptions provided by your kids sound an awful lot like the illustration on the cover of the book without including much else from the text? Or do they stick to physical description rather than describing the character’s personality? If so, this might be a good time to pause for a lesson in characterization. Talk about character traits that are illustrated in the story by things that the character says and does and things that you can learn about a character by the way other characters respond to him or her. After discussing these character traits, kids can practice writing more in-depth answers to characterization questions about the novel. 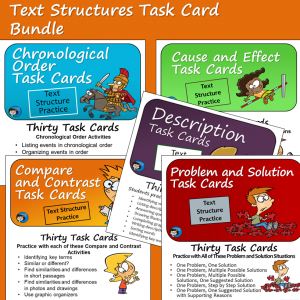 To expand their understanding of characterization for future use, kids can practice their characterization skills with a variety of short activities. 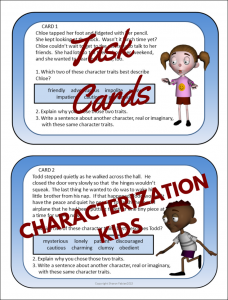 I’ve organized a selection of these in my Characterization Kids task cards. Here you can see a couple of the cards. These two cards each have a short passage followed by characterization questions. Other cards have other characterization activities. 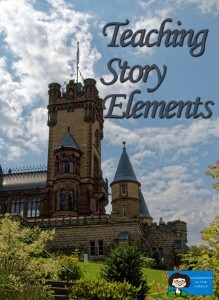 Setting can be especially fun to teach at holiday seasons since many holiday stories have fun settings, such as Christmas tales set in Europe of years gone by or Halloween stories set in a spooky old mansion. To move on from these obvious settings, think about stories set in modern day and in a location similar to where your kids live. Are those settings actually harder for some kids to describe? 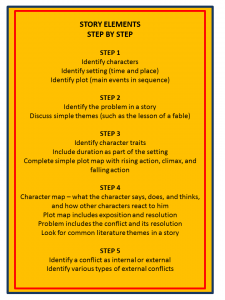 Another wrinkle with teaching setting is that kids tend to think of setting as just the place where the story is located, but of course setting also includes the time and the duration of the story as well. 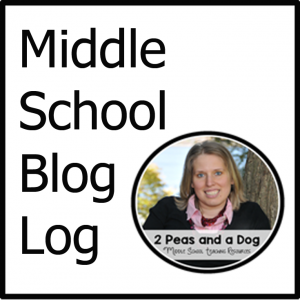 Figuring out, or estimating, the duration, can be especially challenging. 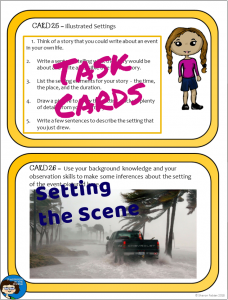 Here are two short exercises on setting from my Setting the Scene task card set. One used a photo as the material, and the other one asks students to think about all of the elements of setting for a story that they could write about an event in their own life. Plot may be the easiest story element for kids to get into – when kids tell about a story, they tend to list what happened in sequential order, so they’re very familiar with the idea. But after the basic timeline, plot gets more complicated quickly. Identifying the climax of a story, for instance, can be trickier than it sounds. 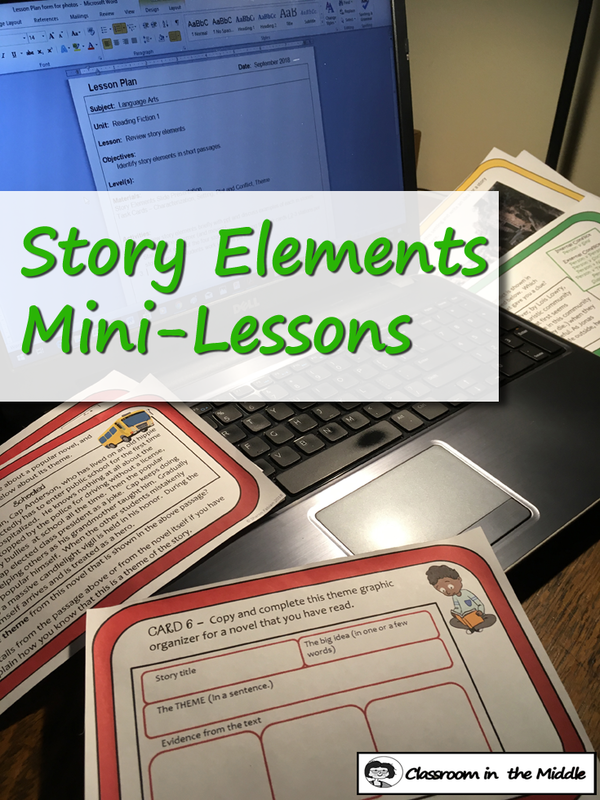 There are lots of ways that kids can show what they know about the plot of a story from a basic timeline, to a more complex plot map, to a fun illustrated storyboard. 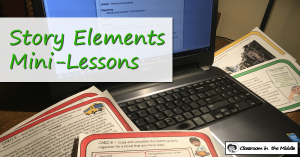 As they work with various stories and passages using these tools, kids build their comprehension skills to make reading that next novel an even better experience. A “Somebody Wanted But So” format is another way for kids to outline the plot of a story. It’s a nice quick one, too, and it focuses on the conflict of the story. One of the cards from my Plot It Out! 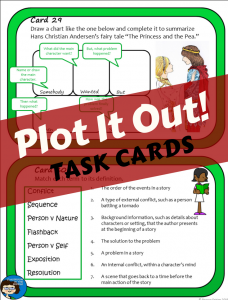 task card set uses this idea, and the other card shown here focuses on plot and conflict vocabulary. Here’s the big one! Theme has got to be the hardest of all of the story elements for kids to really get their heads around. Starting with themes that teach a lesson, like with Aesop’s Fables, seems a good bet here, and conveniently, many versions of the fables actually have the theme spelled out at the end of the story. And the stories are also in the public domain, which is another bonus. But that’s just the beginning. Even though themes that teach an obvious lesson are a great place to start, they’re not the only kinds of themes. And what about longer stories, novels, that have multiple themes? 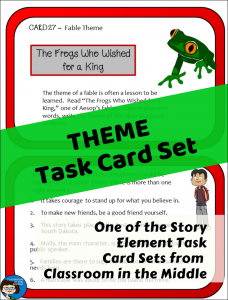 One of these cards from my Get the Message theme task card set is based on the fable “The Frogs Who Wished to Be King,” and the other one is about common themes in stories for middle school and upper elementary students. 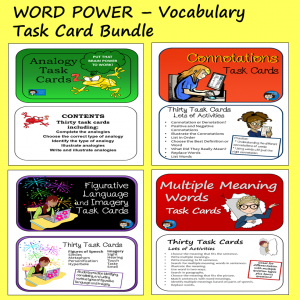 Some people like to use a set of task cards all at once in stations or a class competition; other teachers might use them a few at a time for individualized practice. 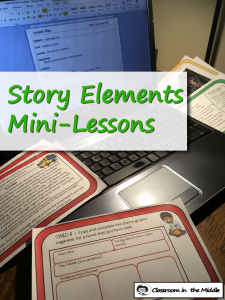 They’re just a nice little resource to have handy as you work on stories throughout the year.